This week on the BeerSmith blog we turn to the Russian Imperial Stout beer style, the king of stout beers. We will explore the origin, history, beer style and some sample Imperial Stout beer recipes for home brewers. Imperial Russian Stouts were actually brewed in England for the export to the court of the Tsars of Russia in the 18th century. A high, malty alcohol content and high hop rate were intended to preserve the beer and also prevent it from freezing during its shipboard trip across the Baltic sea. Thrale’s brewery of London brewed the style preferred by Catherine II’s court in Russia. While the style was regularly brewed in the 18th and early 19th century, this beer has enjoyed a resurgence the last few years with the rise of microbreweries. 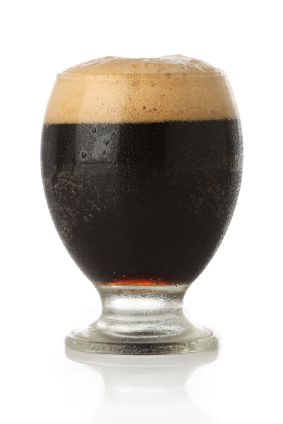 Russian Imperial Stout is a rich, deep, complex beer with full bodied flavor. It has a rich dark malt flavor that may vary from dry chocolate to slightly burnt. A slight alcoholic warmth is normal. It may have a fruity profile including complex dark fruits such as plum, raisin or prune flavors. Like many British beers, it can have a caramel, bready or toasted flavor as well with roast malt complexity. Imperial stouts start with a well-modified pale malt base, generally using UK pale malts. The pale base typically makes up 75% of the grain bill. Roasted malts of all kind are added, usually comprising of a mix of moderately colored caramel malt, chocolate malt and roast malt to provide complexity, body and flavor. Together these make up the remaining 25% of the malt bill. Other malts such as Munich and aromatic are occasionally used, though roast malts make up the bulk of the specialty grain bill. Traditional variations use classic English hops such as Fuggles or BC Goldings, though American microbreweries often also use US hop variants. Hops are typically added as a single boil addition, since a lingering hop aroma and flavor is not needed here. Instead a high hop rate during the boil provides the bitterness needed to offset the malt. Since roast malts provide a very acidic addition, it is not uncommon to use slightly alkaline water when brewing imperial stouts. Traditionally, English Ale yeast or Imperial Stout yeast provides the fruity complexity required for this style, though again some American variants use high attenuation US yeast variants for a cleaner finish. Very high gravity options may require high gravity yeast such as champagne or barley wine yeast. Imperial stouts are fermented at ale temperatures in the 63-68 F range, carbonated at low to moderate carbonation rates, and stored at ale temperatures or lower (as they were during the icy trip across the Baltic). Often Imperials require an extended aging period to achieve full maturity due to the high starting gravity. Thank you for joining us on the BeerSmith Home Brewing Blog. Please consider subscribing for email delivery, and don’t hesitate to tweet or bookmark us using the links below – every little bit helps! Hey Brad, with high gravity worts what is the ideal ppm of O2? I’ve heard that with only aeration the maximum is 10ppm and with oxygenation it can be 30ppm. At what point is the oxygen level too high?